So far, so good. Now the Donnays will have to pull all stops out to get the distillery up and running. The permission is only valid for three years (although as long as construction starts within the three years they're fine). 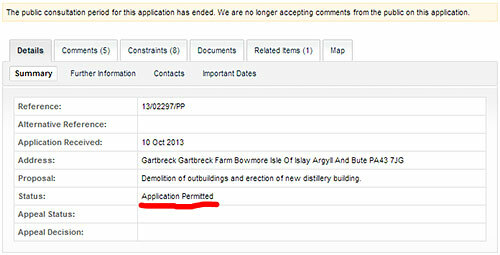 Reading Gartbreck Gets Go-Ahead For Islay Distillery on The Spirits Business I see that Jean Donnay is planning to start building in May 2014 and aims to begin production in late 2015. This looks like it's already slipped from the originally envisaged opening in spring 2015. That gives them about a year and a half, which sounds doable. At the same time, having seen a variety of building projects on Islay slip simply due to the various challenges of building on Islay I wouldn't be overly surprised if it turns to some time in 2016. I expect plenty of people will be following Jean and Martine's journey on building and launching Islay's ninth distillery. It will be interesting to see the ‘two fire-heated copper pot stills – the only distillery on the island to use such equipment’ in operation. Also with other distilleries on Islay reducing or stopping their cask sales I guess their cask sales will generate some interest. Plenty enough to speculate about.